Are you heading out to Las Vegas for a quick getaway? Are you wanting to try something different and maybe even get some Instagram worthy pictures while there? 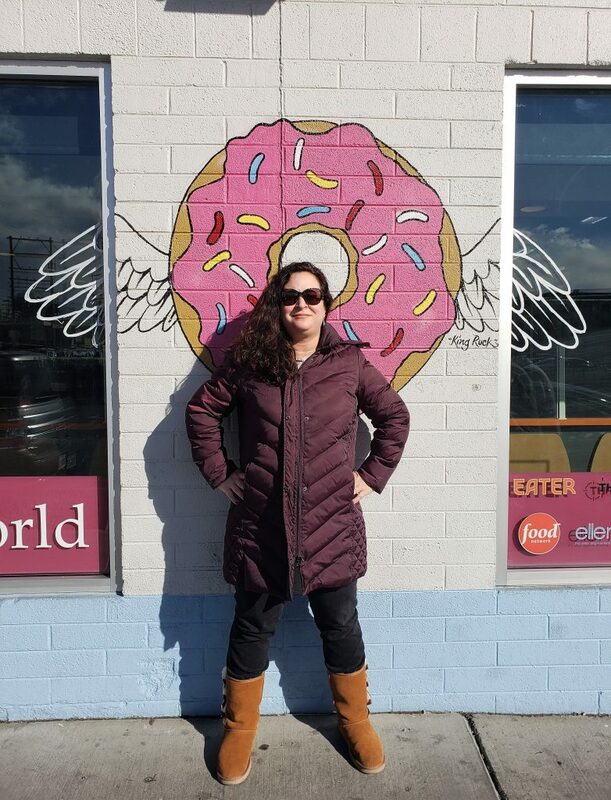 Then you’ll want to head out to Donut Bar in Las Vegas! 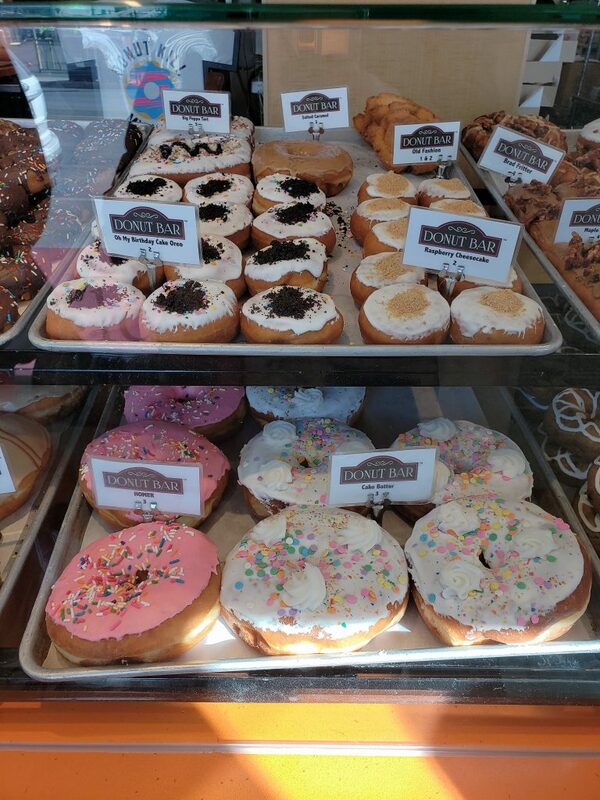 This place does not have your standard everyday donut. 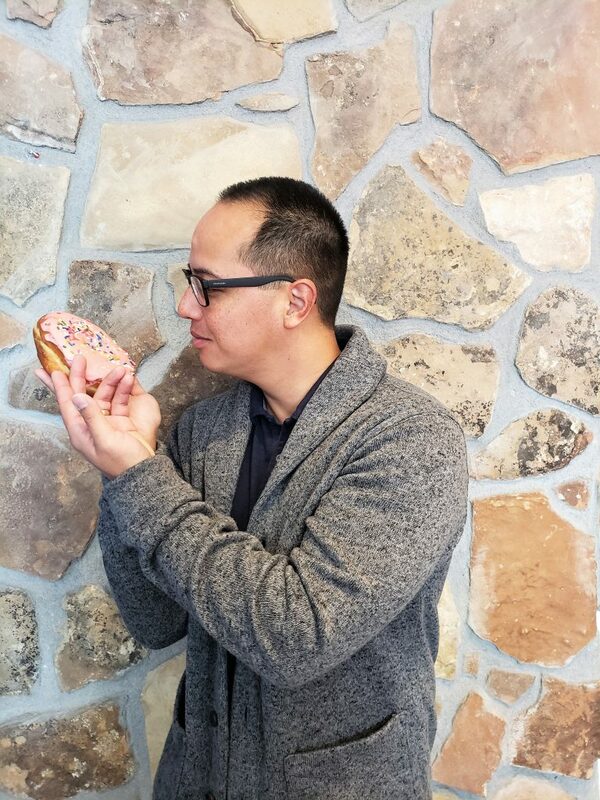 Oh no my friend, here you will find delights such as the Homer Donut. If you ever wanted to eat a donut that looks like the ones Homer Simpson enjoys, this is your chance. The Homer Simpson donut is huge. It was about as big as my kid’s head. That didn’t stop her from stealing it from her dad and eating it though! This post contains Amazon affiliate links. This website earns a commission on qualifying purchases. Trust me, it was very difficult to choose. At a minimum, we knew we had to try the Homer Donut! 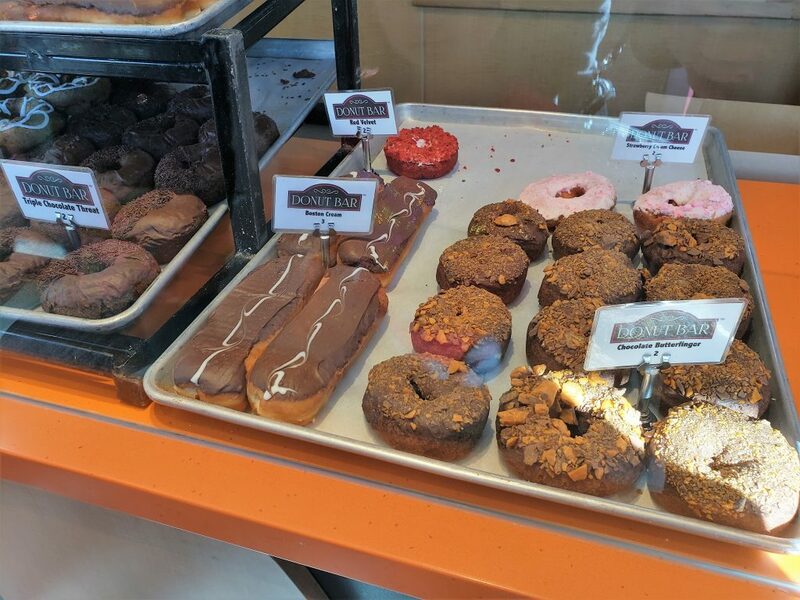 The Donut Bar does not serve your average everyday donuts. Alas, that means they do not cost your everyday prices! 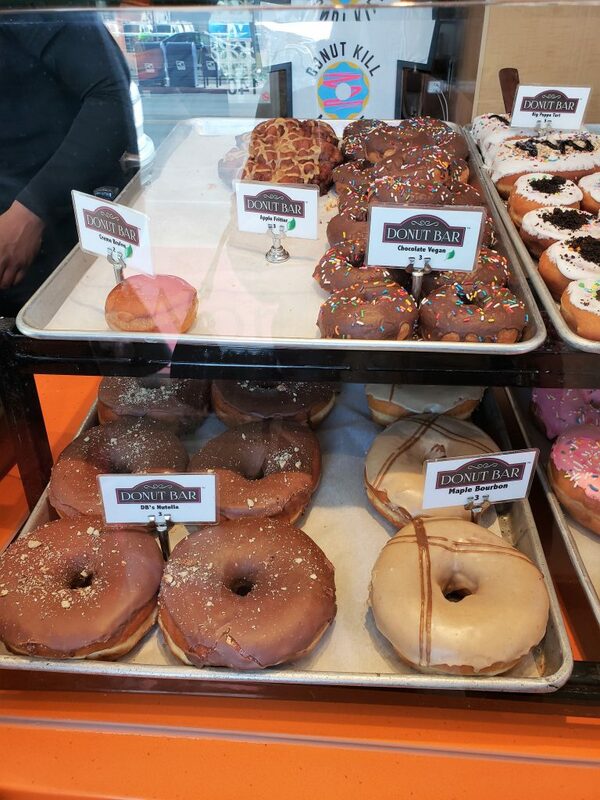 These donuts are very decadent and pretty big. In other words, they are very filling. You can see a price list online. It looks like prices range from around $2 to $5. 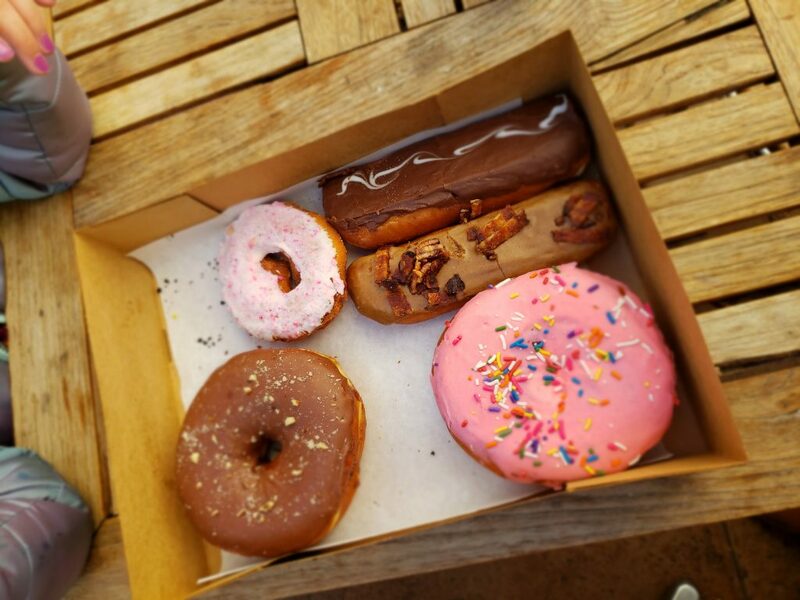 If you want to try out a variety of flavors, I would recommend going with some friends that are willing to split up some donuts so that you can sample as many as possible. 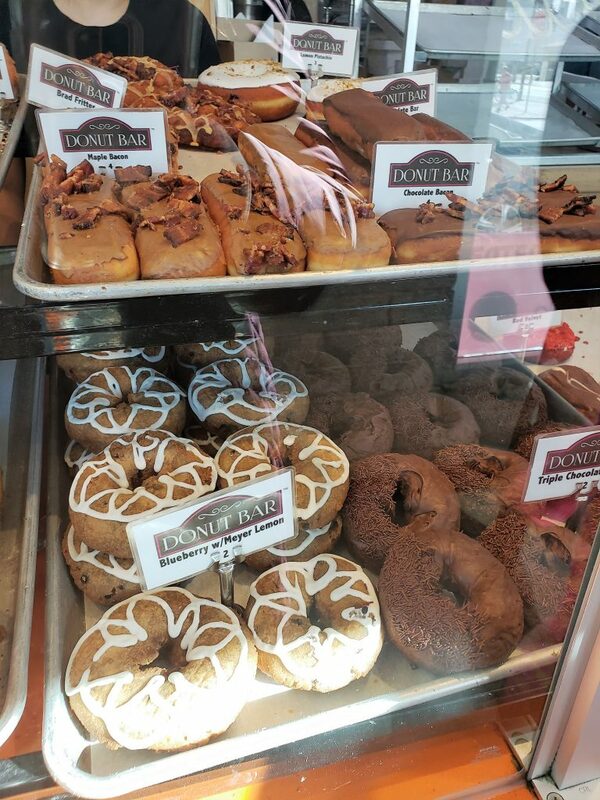 Lets be honest, these are gourmet donuts and you want to try as many flavors as possible! 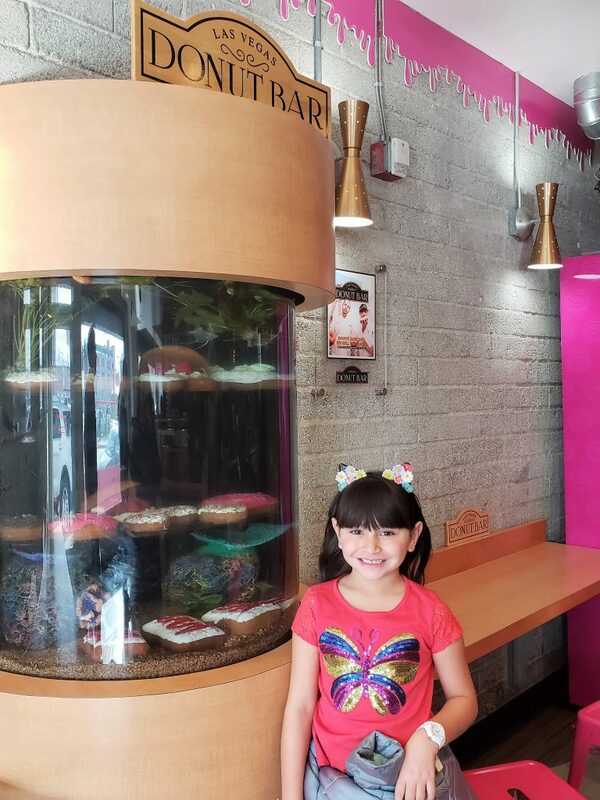 It is one of those experiences where it’s fun to just go and try all of the interesting flavor options. Be sure to get pictures! Another draw of going to Donut Bar? There are some fun picture opportunities! Whispering sweet nothings. Should I be jealous? 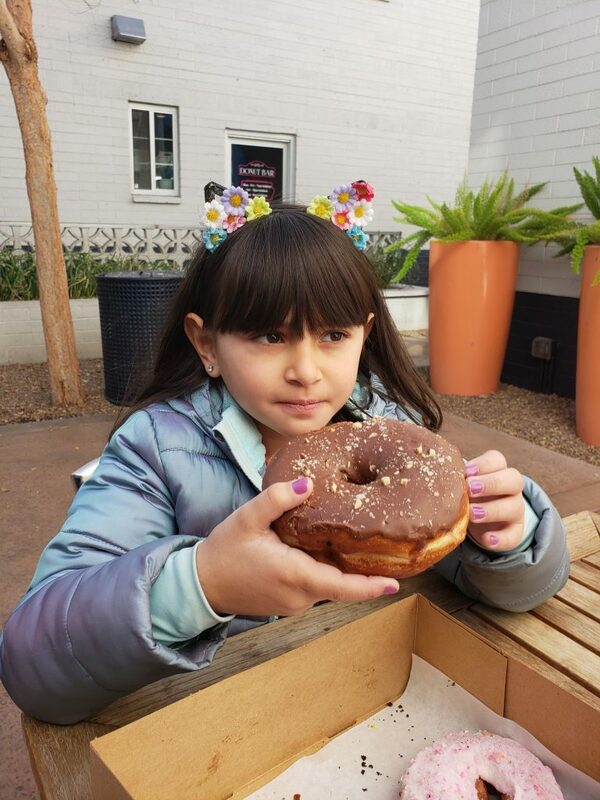 Compare your kid’s head to a huge donut! 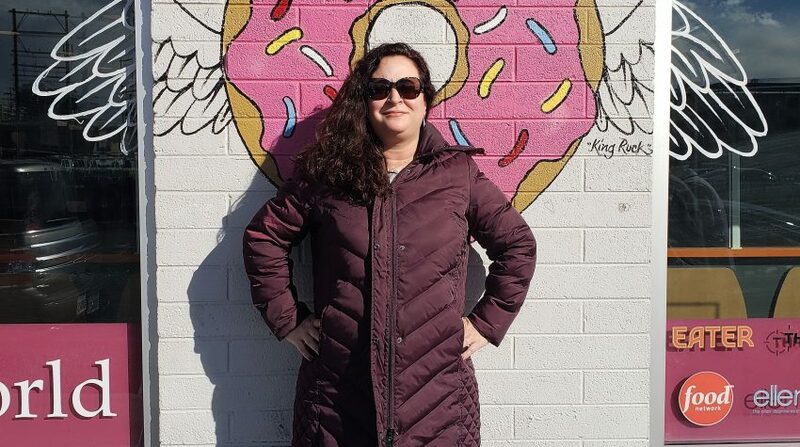 There are a few things you should know before you head out to Donut Bar in Las Vegas. 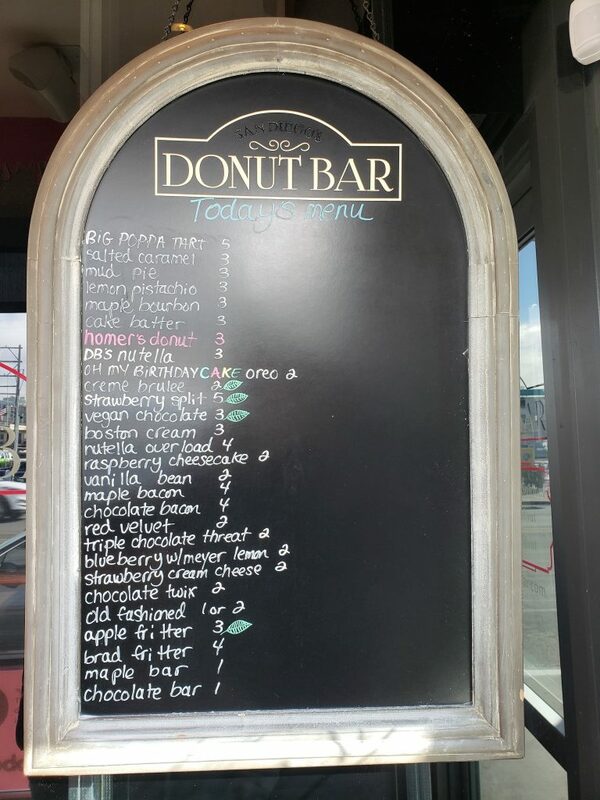 Donut Bar is located close to Fremont Street. We thought this would be a pretty quick drive. We stayed at The Palazzo and it took us about 20 minutes to drive out. I don’t know if it was morning rush hour, but regardless, figured the drive-time from the strip is worth a mention. 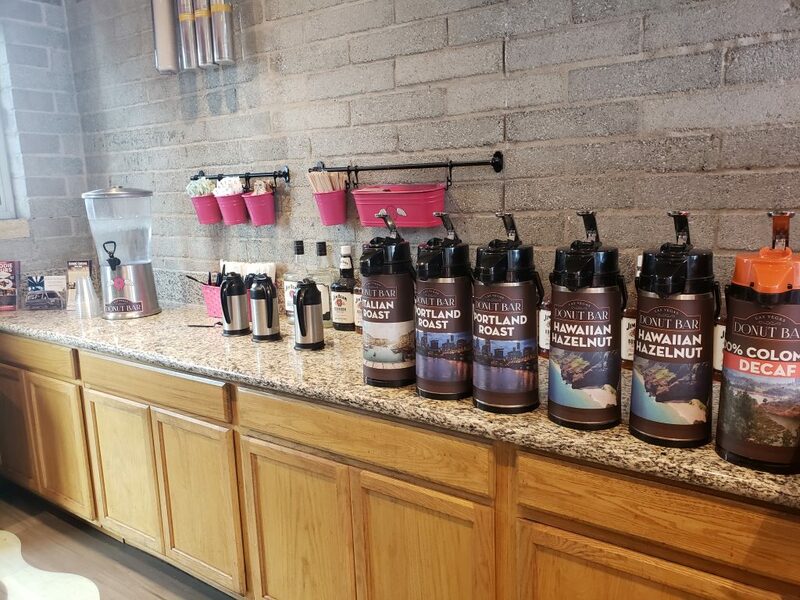 The earlier you arrive, the better your chances of getting the widest variety of available flavors. 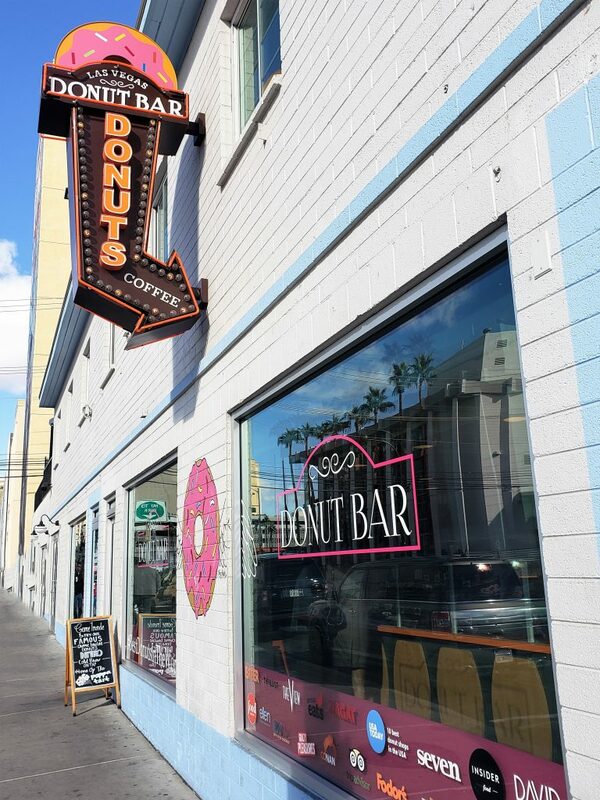 The sign on the door says that Donut Bar closes once they sell out. 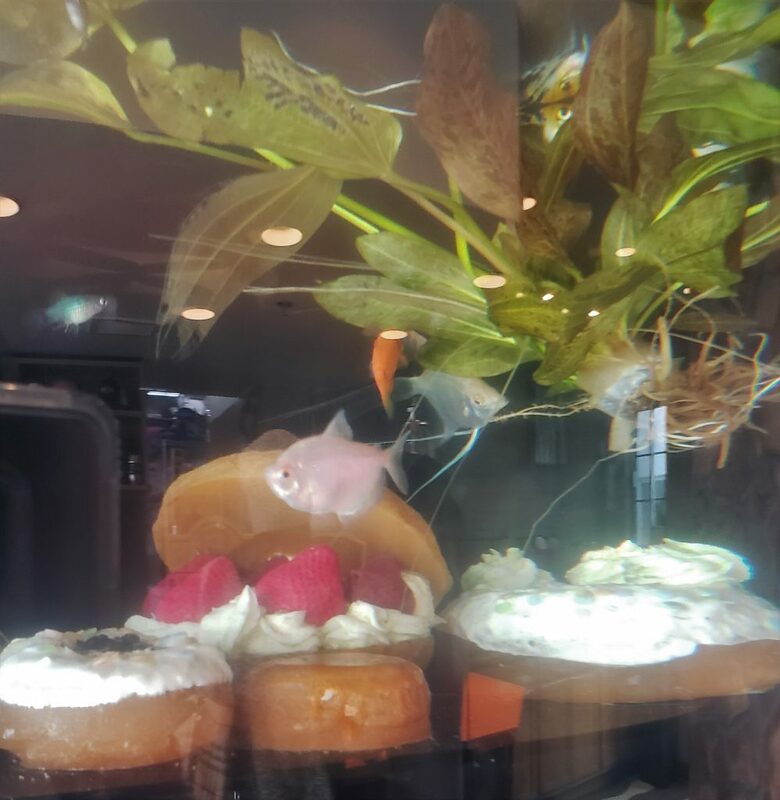 So, if it’s a busy day at Donut Bar, beware! 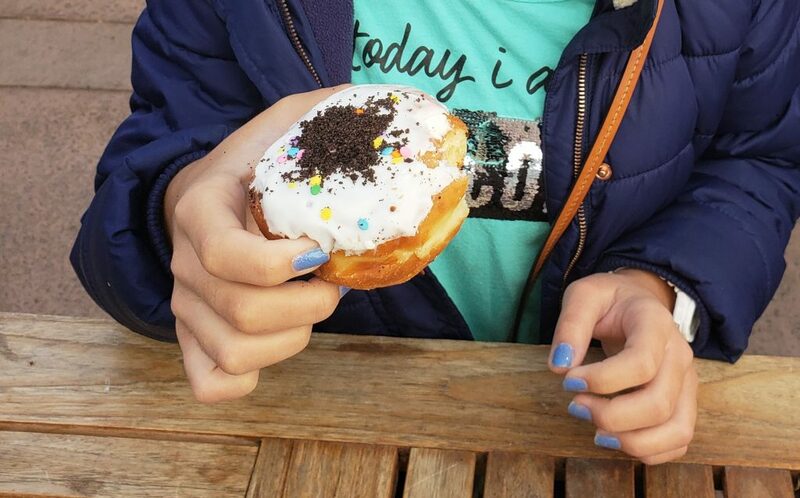 There is an option to pre-order donuts on their website. However, you can only pre-order for the following day. Also, online pre-orders are only open from 3pm to 9pm the prior day. 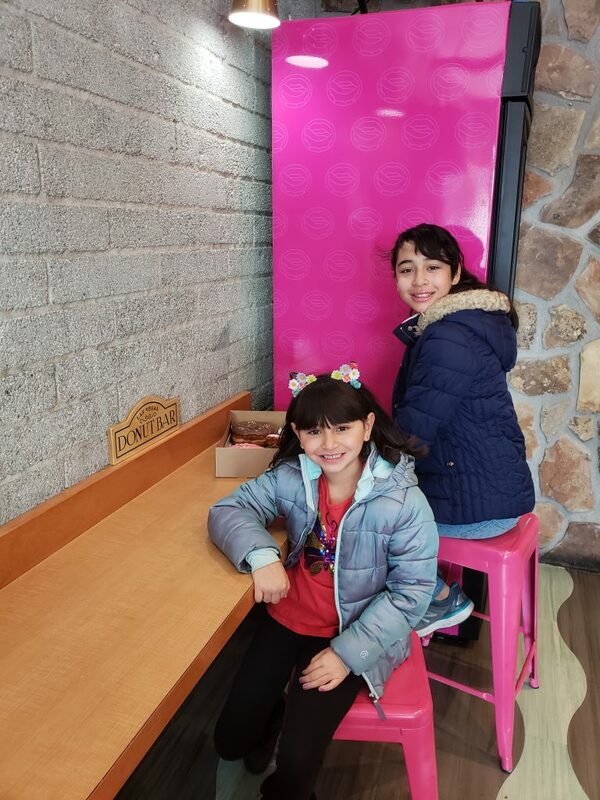 Donut Bar is cute, but pretty small. Be aware that you might not be able to grab a seat. There is a little courtyard with some tables just outside, so be sure to check for a seat there. Be prepared for parking meters! Take change just in case. Our entire family LOVED this outing during our time in Las Vegas. 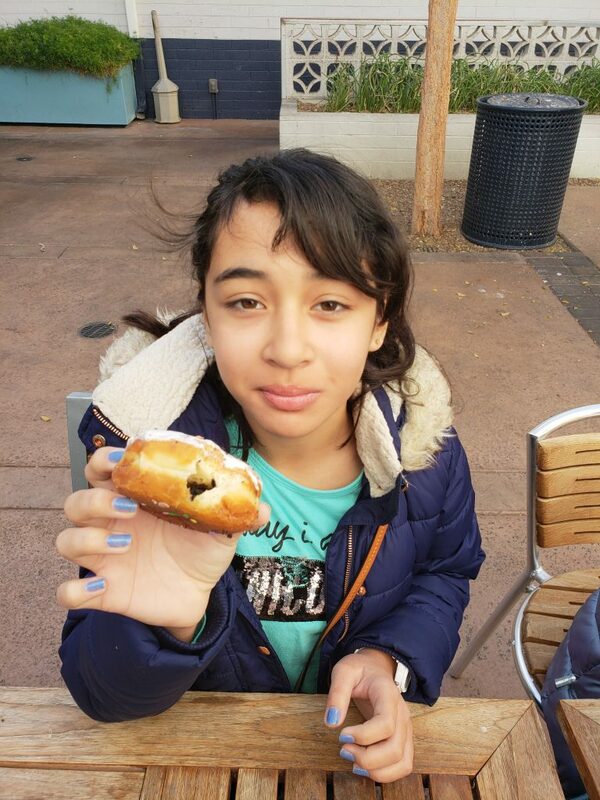 My kids loved the Nutella and Oreo Birthday cake donuts. The hubby and I enjoyed the Homer Donut for sure! 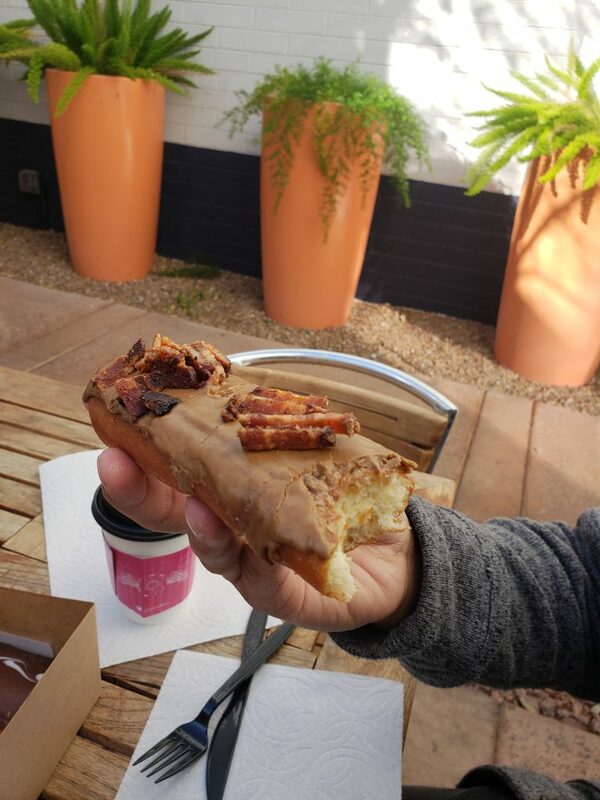 I’d love to hear what you think if you make it out to Donut Bar on your next trip out to Vegas! 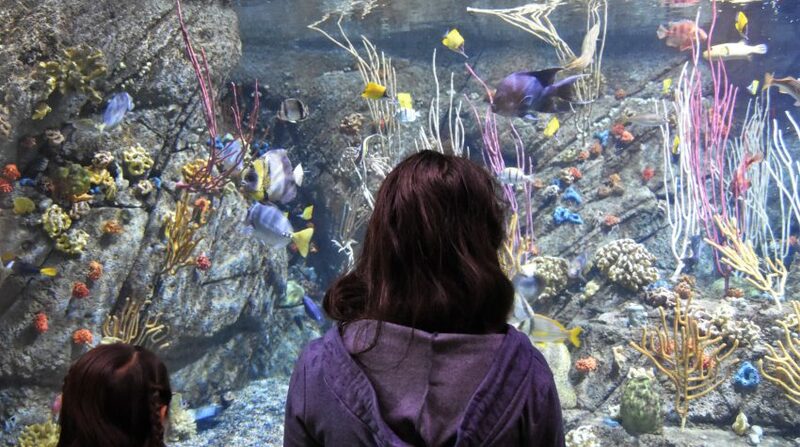 Check out more things to do in and around Vegas! M&M World Las Vegas: Is It Worth It? The Grand Canyon Railway and Hotel: Is It Worth It? « America’s Family and Pet Expo: Coming April 26-28th!